The Hearing Loop Table (Loop Table) is an ADA compliant handcrafted table with a built in hearing loop system. The Loop Table houses a Contacta HLD5 hearing loop driver, digital mixer, and four hearing loop modules under the surface of the Table to provide a complete hearing loop system for up to four people. 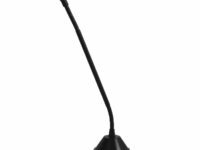 Two or four minimally invasive flush mounted microphones are built into the surface to pick up speech at the Table. 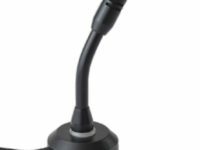 For users with a hearing instrument in the T-Coil program or with use of a Contacta RX20 Loop Listener, the speech at the Table will go directly into the user’s ear significantly reducing background noise. The Loop Table produces clear sound, allowing improved comprehension and communication in settings with ambient noise. Constant ‘ON’ mode when plugged in. Users to do not have to request assistance to use and can be independent in their usage. The Americans with Disabilities Act (ADA) of 1990 prohibits discrimination and ensures equal opportunity for persons with disabilities in employment, State and local government services, public accommodations, commercial facilities, and transportation. (Source: ADA.gov) The Loop Table adheres to the enforceable accessibility standards called the 2010 ADA Standards for Accessible Design. 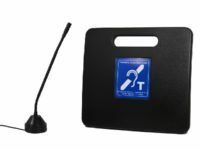 The Loop Table is compatible with users who have a T-coil program in their hearing instrument. With training from their Audiologist, users can activate their T-coil program and no additional equipment is needed to use the Loop Table. If a user suffers from hearing loss but does not have a hearing instrument, a Contacta RX20 Loop Listener can be used. The Loop Listener is a compact device that has a built in T-coil and can be used with headphones or earbuds. 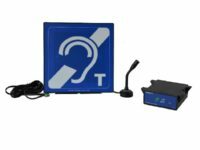 The Loop Table will come with a hearing loop sign on the table and an additional hearing loop sticker that can be posted within the venue to inform patrons of the availability of the assistive listening system.